• Overall in-charge for conduct of District Level and Mandal Level orientation as per the schedule. • Instructions to the all the Principals of DIETs, Deputy Educational Officers, MEOs and Sr. Teachers wherever required. • Monitor the Programme for in-time completion. • The Project Officers is the convener of the entire School Accreditation Programme in the District. • Monitoring of the entire programme by appointing all sectorals as divisional wise in charges. • Time to time updating of the programme and same should be sent to the SPO. • Day to day monitoring of pre-assessment on evaluation and dash board. • Re-confirmation of self assessment done by the HMs. •Ensure that all Schools under all managements should be uploaded their school evaluation reports. • Proper instructions to all the HMs for filling up of Dash Board information. • Conduct of school level orientation to all the teachers in the school. • Study and preparation of pre-assessment as per the schedule on DASH BOARD. • Head Master is responsible and liable for any wrong information furnished in the portal. •CRPs are responsible for the collection of the hard copies regarding the Shaala Siddhi DASH BOARD and to assist the MEOs for re-confirmation of the self assessment done by HMs concerned. 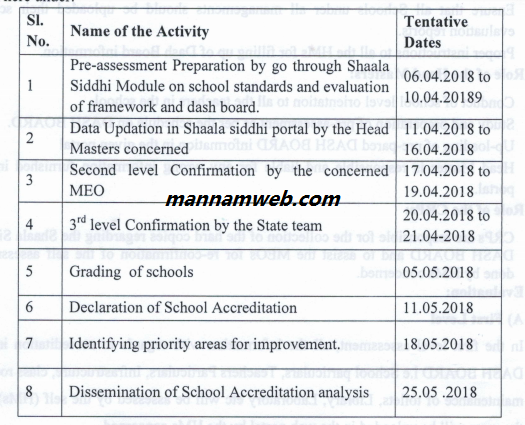 In the first level assessment, all the information with regards to accreditation in the DASH BOARD i.e School particulars, Teachers Particulars, Infrastructure, class rooms, maintenance of toilets, Library, Laboratory etc will be assessed by the self (HMs) and the same will be uploaded in the web portal by the HMs concerned. In the 2nd level assessment, all the seven key domains which are given in the guidelines should be verified and re-confirmed by the MEOs concerned and MEOs are responsible for any wrong information. Based on the MEOs confirmation, all schools will be graded and MEOs should not show any favour to any particular school. c)Third Level: by state team involving the members of SPO AP SSA, CSE, SCERT, DIETs IASCs, District Educational Offices and District Project Offices of SSA. All schools will be awarded by star grading according to their assessment by aggregating the Self Evaluation done by the HMs and External Evaluation carried out by the Mandal Education Officers concerned. Based on the Accreditation Analysis, all schools will be supported and facilitated in the areas of Academic, Quality and Infra facilities etc. Further it is informed that the Observers (list herewith enclosed) shall be attended to the allotted districts on 06.04.2018 to observe the preparatory things of the programme and complains report will be submitted to this office. The state observers are requested to claim their TA& DA from this office. For schools user ID is school udise code , password is 123456. Pl.monitoring day wise updation report. The above link also available in the school tabs also.